"The survey is exactly what we wanted. It was easy to use and the results were easy to interpret. The service has been outstanding - we will be using it again!" "We found the whole process very straightforward and clear and I found the website very easy to use. The topics covered and questions were very comprehensive and pinpointed exactly the areas that we wanted to look into. It was useful to be able to view the graphs 'live' at any point." Hello. I am Bruce Greig, the creator of School Staff Surveys. I am a school governor myself. 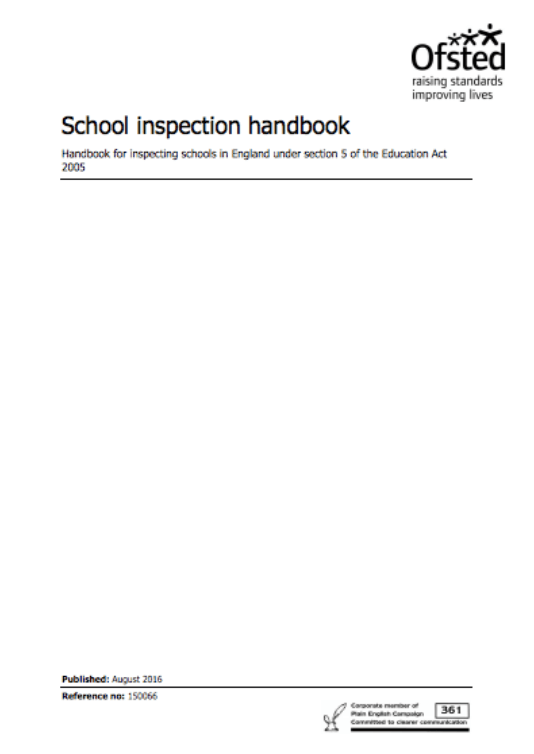 I was Chair of Govs through four headteachers and two Ofsted inspections. A long time ago, I was at a school which had some unhappy teachers who were reluctant to speak out. An anonymous wellbeing questionnaire helped us tease out what some of the issues were. This was transformational for the school. So I set up School Staff Surveys to make it easy for other schools to run regular staff wellbeing surveys. 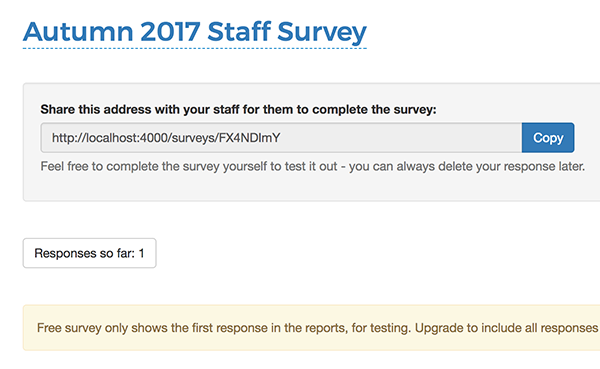 It is surprisingly hard to use something like Survey Monkey or Google Forms to run a staff wellbeing / engagement survey. You have to find or think up the questions and type them all in. 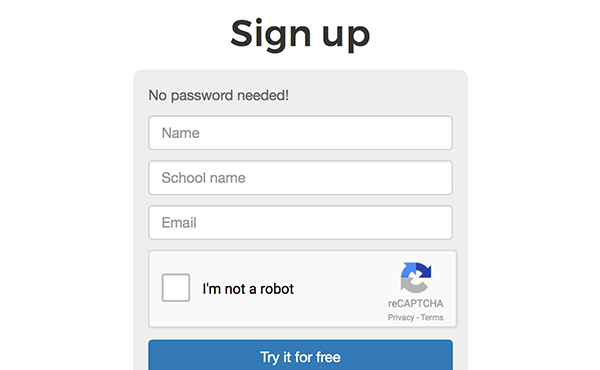 There are some very specific drawbacks of each of the free tools which make them not ideal for schools. For example, Google Forms can’t display the results of long questions very well. I know all this, because I offered to set up a staff wellbeing questionnaire in Google Forms at that school after the admin team struggled with it. I got it to work, but it was a bit clunky. So I built SchoolStaffSurveys.com as a better alternative. It isn’t free, but it is great value compared to other paid-for services and does a better job (I think) of a school staff survey than the free options. The question set we use is one of the most respected and rigorous in the world, relied on by almost all branches of the UK Civil Service from the Cabinet Office to the DVLA. We are using it under licence from the Cabinet Office. It's free to try everything out, then £100 per survey you run. You can run them as often as you like. Or never again if it isn’t your cup of tea. We’ll create a unique link which you send to your staff. Staff complete the survey confidentially on any computer, tablet or smartphone. There is no limit to the number of responses you receive for each survey. The price is per survey, not per response. You can review the responses as a page of beautiful graphs. Share with staff and governors and anyone else, or no-one else, entirely up to you. Lots of commercial providers want to sell you a truckload of expensive support services alongside their surveys. We just do surveys, and do it really well. Deciding a set of rigorous questions is very hard. 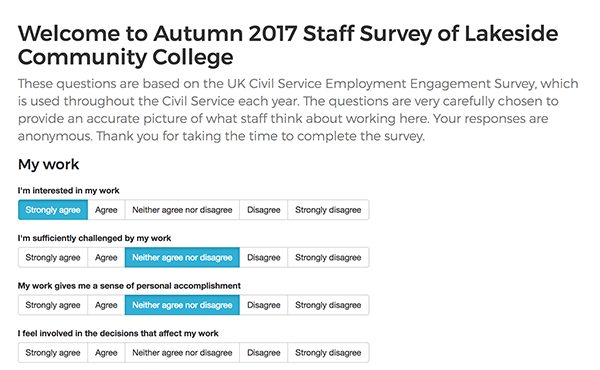 Skip the hard work and use the world-renowned UK Civil Service Staff Engagement survey questions (used here under Open Government Licence from the Cabinet Office). It doesn’t, really. And it only scratches the surface, designed to help the inspector know if there is serious trouble amongst your staff, but it is not sufficiently detailed or rigorous to really be used as an ongoing tool. Nope: just email your staff a special link and they can complete the questionnaire online in a few minutes. Works on any computer, tablet or smartphone with an internet connection. Nope. 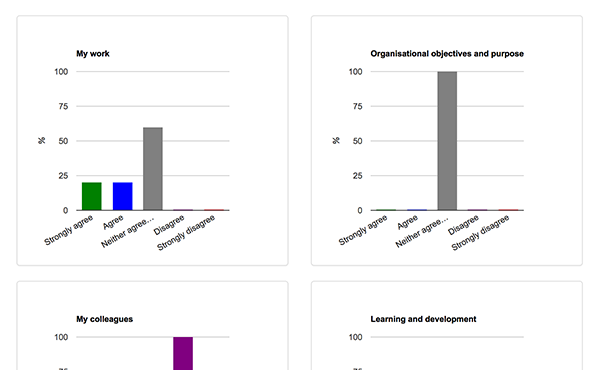 With SchoolStaffSurveys you’ll get smart graphs, in the same familiar style as Ofsted’s ParentView graphs. Yes, you do. If you have got this far, you are an experienced school leader. It isn’t rocket science. Try it out and you’ll soon see which areas need your attention, and which aspects are humming along nicely. You do. Your school will be spending hundreds of thousands, maybe millions, of pounds a year on staff salaries. Spending £100 on helping you manage them is well worth it. “My staff speak openly to me. I don't need a survey." Maybe the schools I've experienced are unusual, but I'm amazed at how reluctant education people are to speak openly, compared to other modern workplaces. If your survey shows you nothing you didn't know already, no harm done. But you might find out things you didn't know. That's a good thing. 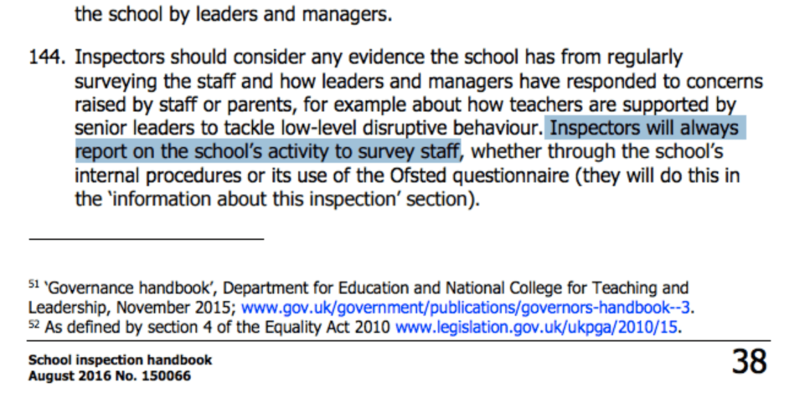 Outstanding schools regularly survey their staff. Join them. Have you ever met a great teacher who hated their job? If your staff are happy and engaged they are much more likely to become great teachers. Staff who feel engaged are more likely to be prepared to try, and suggest, new approaches and techniques. Teachers who leave a school often don’t tell you much about why. Find out before people are thinking of leaving what their concerns are. If you build a reputation as a school that listens to its teachers, you will find it easier to attract the best talent. If you want to, you could even publish your survey results for prospective candidates to read.